And yours was a more relaxing productive day..
Great way to spend Easter Bill, I spent mine digging the garden and laying a few slabs.. I had Aussies and Border Collies until about 4 years age. They all ran agility and were ranked in the state of Florida so I sorta know what you are saying. After my last Aussie died Aussie Rescue asked if I'd take a Brittany Spaniel because no one would take him so he is what I have now. But I did love my Aussies my Border Collie. They are both great breeds of dogs.. Blue is 2 1/2 and just cant contain the excitement at agility. Because I have back and hip problems due to an accident years ago I can't run so have to walk so he is learning to work away from me. Last week he did a round just jumps, tunnel, tyre and weaves and I did not have to move much and then just taking small steps so I was still moving and he did it beautifully, I was so pleased with him I punched both hands in the air and he got a round of applause from my class members... You will have to post a picture of your spaniel..
Looks like a really BIG boy. I like the eyes. Thanks Larry, he is quite big, 24/25" to the shoulder on a rough measure and about 25.5 kg. He is bigger than his Dad and a lot bigger than his Mom. She is a Red Merle and Dad is a Black and white. We do agility and it is hard sometimes to hold him back as he wants to go and do it but at least its better than not wanting to do it.. My fried has both parents that I have known since puppies so I was 99.9% sure what temperament he would have and he is a softie.. I saw him at an hour old and knew he was mine so I was a lot of him in the first 8 weeks. His sister who was born in the next litter( of 1 pup) has eyes like his but opposite was round. Another of my garden friends. Very good, love the last one.. Very good effort for a first try, like the other comments I too feel the flower should stand out from the background a bit more. Also when you cut your flower out zoom in to make sure you have all the black edges taken off as they can spoil an image.. 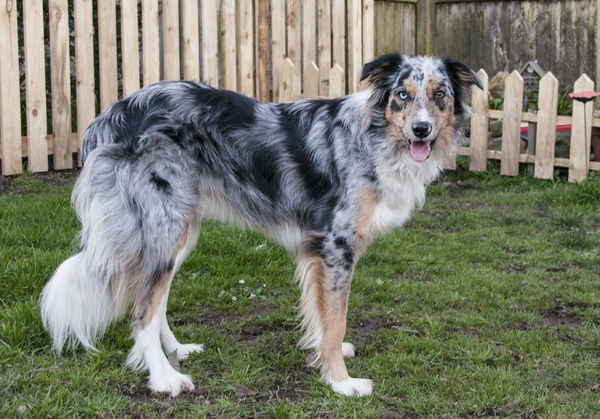 Thanks but he is not an Aussie, but a Tri Coloured Blue Merle Border Collie... A lot think he is an Aussie. I think they’re dreaming; don’t offer anything over $350,000. Very good, I will put my bid in next week..